Emirates is currently running a promotion on their famous Business Class products for travels between 01 January 2018 to 30 June 2018 - booking needs to be completed before the end of 25 December 2017. Travellers will be able to experience the A380 Onboard Lounge and also enjoy complimentary chauffeur-drive services when they fly on Business Class. Click HERE to check out the promotional Business Class fares on Emirates! The Emirates’ experience begins as early as when travellers leave their homes. Promising a seamless, well-rested journey of comfort from start to finish, Emirates’ First and Business Class travellers enjoy complimentary chauffeur-drive services to and from the airport in over 70 cities worldwide. Travellers can also savour gourmet cuisine and stay refreshed with complimentary access to Emirates’ exclusive lounges, located in over 30 airports. As the world’s largest operator of Boeing 777 aircraft, Emirates recently unveiled the brand new interiors for its fleet at the Dubai Airshow 2017. Onboard the newly-refreshed Boeing 777, now operating on flights to Geneva and Brussels, travellers can indulge in uncompromising luxury inspired by the interior of a modern sports car. The new Business Class cabin features 42 flat-bed seats, each equipped with 72 inches of pitch, with diamond stitch leather upholstery delivering a touch of Mercedes-Benz luxury. Amping up comfort and relaxation levels are touchscreen controls for the seat, personal lighting options, privacy panels between seats, a shoe stowage area, footrest, and a personal mini-bar. Emirates’ latest First Class product follows a similar design philosophy to the Mercedes-Benz S-Class, bringing together two global brands renowned for innovation, luxury, and comfort. The collaboration inspired several design details in the fully-enclosed Private Suite, including the soft leather seating, high-tech control panels, and mood lighting, taking luxury and privacy in the air to the next level. The new Boeing 777 cabins also boast a new generation of Emirates’ award-winning ice inflight entertainment system, offering improved and superior image quality. Each in-seat screen will feature ultra-wide viewing angles, a capacitive touch screen, LED backlight and full HD display. Emirates is also the world’s largest A380 operator, with 101 aircraft in its fleet, and another 41 on order. First Class passengers onboard the A380 can relax in one of 14 of its flat-bed, massage-equipped Private Suites. The onboard Shower Spas provide for plenty of rest and relaxation in the air, ensuring that travellers are perked up and ready to go on touchdown. 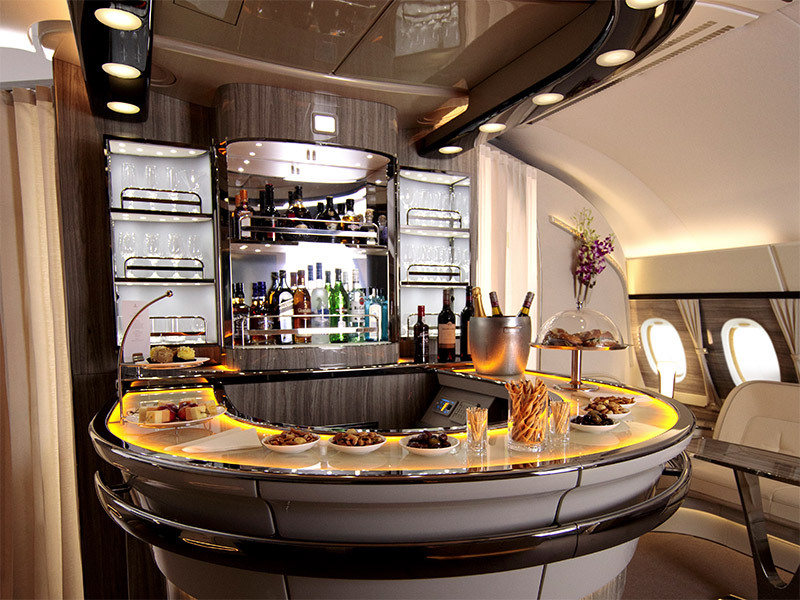 Additionally, First and Business Class passengers on the A380 can experience the Emirates’ Onboard Lounge, where they can socialise, network and enjoy complimentary beverages, canapés and other special delicacies.